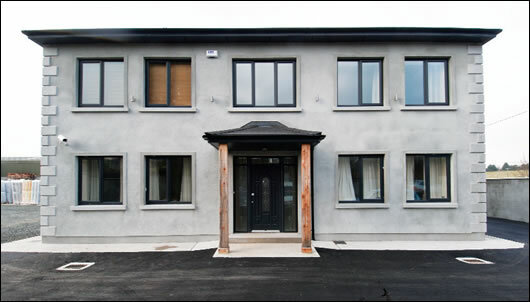 Ireland's first passive house development emerged as the big winner at the inaugural Isover Energy Efficiency Awards in February. The Grange Lough project — by developer Michael Bennett and Shoalwater Timber Frame — won first place and will represent Ireland at Isover's European awards in Barcelona this June. The project was awarded €10,000. Two refurbishment projects finished as joint runners up — the extensive renovation of the old Carrolls cigarette factory — now part of Dundalk IT — by BDP, and the A1 energy overhaul of a dormer bungalow in Wicklow. For buildings to be eligible for the awards, their construction must have incorporated at least one Isover product. The company supplies a range of energy efficiency materials, such as its Metac high density glasswool and its Vario range of airtightness tapes and membranes. Isover Ireland also recently launched its new Optima dry lining system, which it describes as an “innovative interior insulation system”. The adjudication panel for the awards included leading Irish experts in the field of green building, including Tomás O'Leary of the Passive House Academy of Ireland, Construct Ireland editor Jeff Colley, sustainable design consultant Jay Stuart and Isover engineer Zdenka Debartoli. The following projects were short listed for the award. Grange Lough is Ireland’s first passive house development — Shoalwater Timber Frame completed the first house last year, and the site will eventually feature eight detached passive houses. 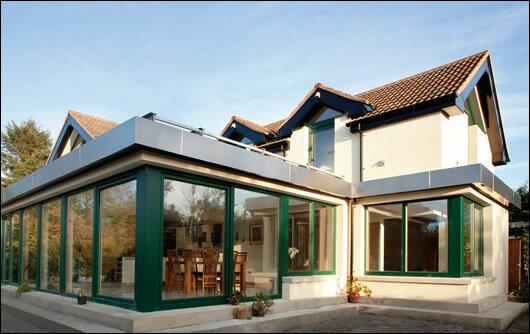 The aim was to localise the passive house concept by prioritising Irish products and suppliers. Oddly for passive buildings, the house has a fireplace — developer Michael Bennett believes the houses will sell quicker with traditional features. 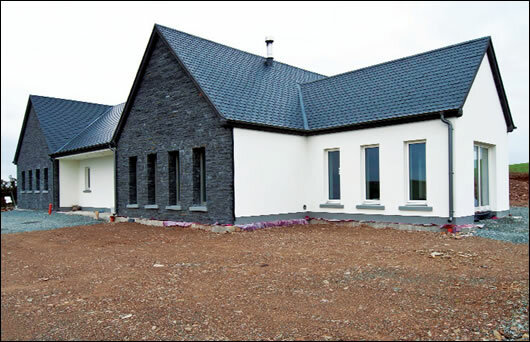 Nonetheless, the first house still met the onerous passive house airtightness standard of 0.6 air changes per hour by using an “improved version” of an external air supply inset stove. Shoalwater used Isover Metac insulation in the walls and roof. A condensing gas boiler and small wood stove provide what little heat the house needs. The first Grange Lough house carries a price tag of €490,000. But Shoalwater’s Donal Mullins wants passive building to become affordable to everyone. “Why not get into a position where we can supply passive houses at affordable prices to the county councils?” he said. The project was featured in the January/February issue of Construct Ireland (issue five, volume five). The refurbishment of the iconic Carroll’s cigarette factory in Dundalk boosted its BER from a G to a B1, particularly impressive considering the building's protected status made a conventional retrofit impossible. 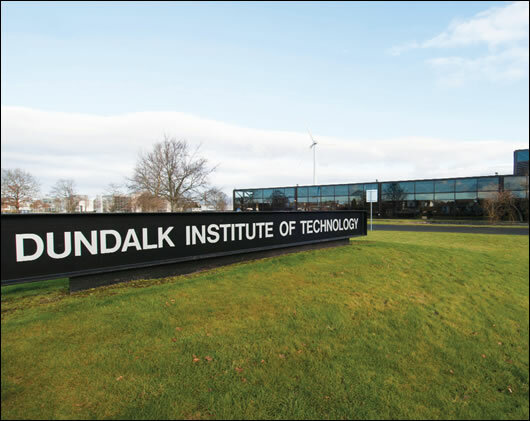 Now part of Dundalk IT, the building is one of Ireland’s foremost examples of Miesian architecture. Built in 1967, the factory’s upper level is lined with single glazing — this was designed to show off the building’s engineering services by making them visible from outside. To maintain this feature, BDP put the insulation and airtight layer at ceiling instead of roof level. This required services to pass through the airtight layer, so detailed attention to sealing was required. BDP installed a large ice bank in the building’s basement to store energy from the 850kW on site wind turbine. They also added naturally ventilated and naturally lit winter gardens to the building’s core. The building features Isover Vario airtightness products. BDP’s Chris Croly wrote about the building in the January/February (issue five, volume five) issue of Construct Ireland. Randy Ralston and Mel Cronin’s 1970s dormer bungalow in Rathdrum, Co Wicklow was the first house in the country renovated to an A1 standard. A wind turbine and solar PV panels produce electricity for the house, which also boasts an air-to-water heat pump and a 20 square metre array of solar thermal evacuated tubes. As part of the upgrade, the original cavity walls were pump-filled with bonded bead and externally insulated with expanded polystyrene (EPS). The old roof was insulated with cellulose, Rockwool and Gutex woodfibre board. Triple glazed windows were installed throughout. Randy and Mel were aiming for the passive house standard, and they obsessed over getting the airtightness down to the required 0.6 air changes per hour. They ultimately got down to 0.92 — still a superb result for a renovation. Isover Vario tapes and membranes were used in the build, as was the Isover Optima internal lining system. According to the BER assessment, the house “achieves in excess of an A1 rating” — meaning it should produce more energy than it consumes. ““We went through one of the coldest winters on record, with deep snow all around, in fantastic comfort,” Randy told Construct Ireland last year. 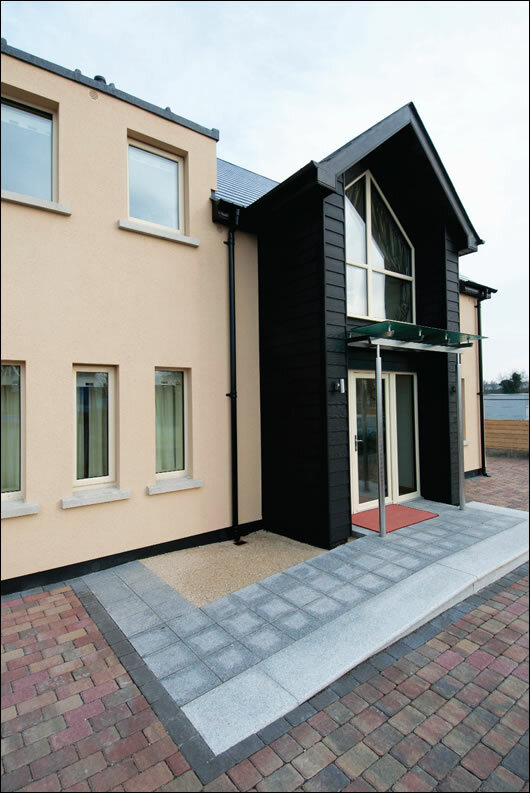 A highly commended award went to this new house built by the Timber Frame Company in Wexford. 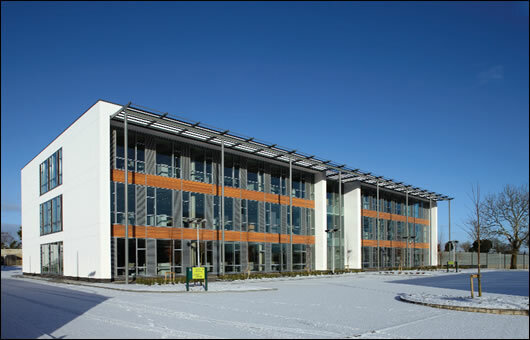 TTFC use a fully closed panel timber frame system, meaning insulation is installed in factory rather than on-site. According to the company, this allows for exceptionally high standards of insulation and airtightness. The house features Isover Metac insulation in the walls and roof, as well as Isover Vario airtightness tapes and membranes. The walls have a U-value of 0.18 W/m2k, while the U-value of the roof is 0.15 W/m2K. 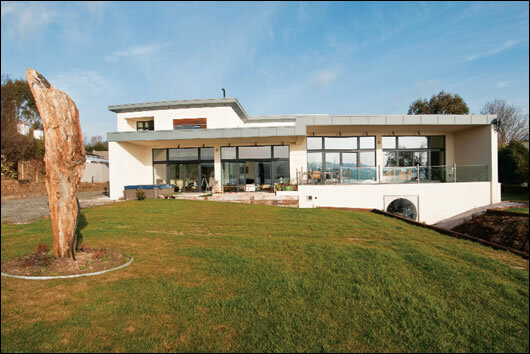 The house also boasts an exceptional airtightness result of just 0.5 air changes per hour, and has an A3 BER. Designed by Daly Molloy architects, the cube-shaped house also features heat recovery ventilation. Designed by BDP, the new home of Graham Construction has a host of green features. For one, it boasts a naturally ventilated server room — an impressive achievement, as server rooms generate lots of heat and typically require mechanical cooling. Most of the building is naturally ventilated. The highly glazed south east facade here takes advantage of the morning sun for passive heating in winter, while solar shading on the upper floor prevents overheating in summer. The building also features a wood pellet boiler and rainwater harvesting. Low carbon cement was also used throughout, and all timber was certified as from sustainable sources. The building achieved an ‘excellent’ rating under the Building Research Establishment’s Environmental Assessment Method, which measures the overall environmental impact of buildings. BDP’s Chris Croly wrote about the building in the July/August 2010 issue of Construct Ireland. He described it as an “essential case study for anyone who doubts the ability of naturally ventilated office buildings to produce a quality internal environment”. Robert Lacey said his aim with this A3 rated timber frame house — built for himself — was “to prove low energy housing works”. He emphasises the importance of planning low energy buildings in detail from the outset, rather than making decisions as you go alone. The construction features 320mm of Isover Metac insulation in the walls and 220mm in the attic, where there’s a further 400mm of standard Isover glass wool insulation too. Lacey also used Isover Vario tapes, membranes and glues. The house also has solar thermal collectors, which contribute to its hot water demand, and multi-fuel stoves. A condensing oil boiler heats the house, but Lacey says he only needs heat for about an hour a day over the winter. “It pays off, I know it works,” he says of low energy housing. The Stoney Park scheme on the outskirts of Wexford town features 18 low energy timber frame houses. Bawn Developments say their aim with the project was to provide low energy homes at affordable prices. 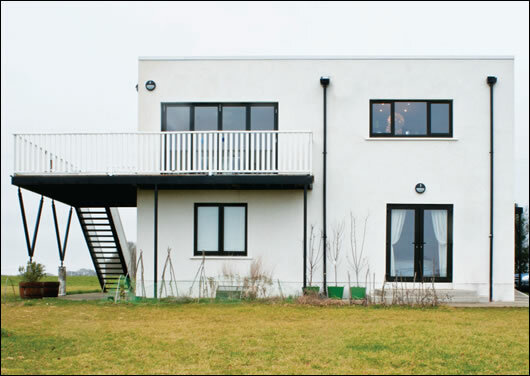 The dwelling tested boasts an airtightness of 2.06 m3/hr/m2, a very good standard for new build. The houses also feature solar thermal collectors, heat recovery ventilation and high efficiency condensing gas boilers. A wide variety of Isover products were used in the construction: 125mm polystyrene insulation under the floor, 300mm Metac insulation in the attic, 150mm Metac in the timber frame walls and the Vario airtightness system too. The houses has an A3 BER, and the walls, roof and ground floor have U-Values of 0.25 W/m2K, 0.12 W/m2K and 0.22 W/m2K respectively. Built by Eco Timber Frame in their Cork factory, Stephen and Karen Ward’s home is insulated with cellulose and features a variety of ecological materials, including Ecocem low carbon cement and roof slates produced from recycled rubber. The house also features a rainwater harvesting system that provides water for toilets and gardening. All its windows are triple glazed. A wood pellet boiler provides heat and hot water along with solar thermal collectors. The house achieved an A3 building energy rating — particularly impressive as the Wards had to build a single-storey house, giving them a larger surface-to-volume area and making it more difficult to achieve an A-rating. The house was profiled in the January/February issue of Construct Ireland (issue five, volume five). Situated in Crosstown, Co Wexford, this private house was constructed from concrete cavity walls. The wall cavities were pump filled with 200mm of Eco Bead, with Isover Calibel dry lining inside. 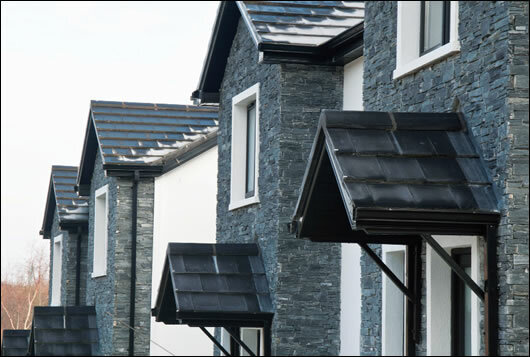 The roof features 270mm of Metac insulation, plus 50mm of Kingspan rigid insulation. Services were installed under the raised timber ground floor, which is also insulated with Metac. The Isover Vario airtightness system was used throughout too. And because the basement is at water level, proper weatherproofing was essential. “It’s highly insulated and airtight,” Liam Keating of Keating Insulation says of the house, which also features heat recovery ventilation and a log stove. The house received a B1 BER.